PHILADELPHIA (AP) — Accountability has become a common theme in the Philadelphia Eagles‘ locker room. The team relied on strong brotherhood and camaraderie to overcome a lot of adversity and capture the franchise’s first Super Bowl title last season. Now, players are questioning whether their teammates have enough drive and desire. Last week, center Jason Kelce said “there was a much greater level of accountability from a cohesive standpoint” in 2017. On Tuesday, safety Malcolm Jenkins said “the demeanor of the team really bothered me” in a 48-7 loss to the Saints. Coach Doug Pederson and quarterback Carson Wentz responded to Jenkins’ comments in different ways Wednesday. After Jenkins got beaten by Alvin Kamara for a 37-yard touchdown catch on fourth-and-7 in the fourth quarter and the Saints already leading by 31 points, Jenkins raised two middle fingers to his former head coach Sean Payton. Then he slammed his helmet to the turf on the sideline. Wentz was visibly frustrated after throwing an interception earlier in the game and punched the air as he walked toward the bench. The Eagles were a close-knit group last season on their way to a 13-3 record. Players stood up for each other, supported one another and it was evident in how they overcame a slew of injuries to key starters. Wentz was having an MVP-caliber season when he tore two knee ligaments in Week 14. But Nick Foles stepped in and ended up becoming the Super Bowl MVP after leading Philadelphia past Tom Brady and the Patriots, 41-33. That seems far longer than only nine months ago. 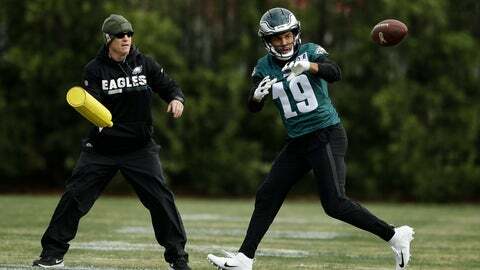 The Eagles (4-6) have lost two in a row and will try to snap a three-game home losing streak when they host the New York Giants (3-7) on Sunday.